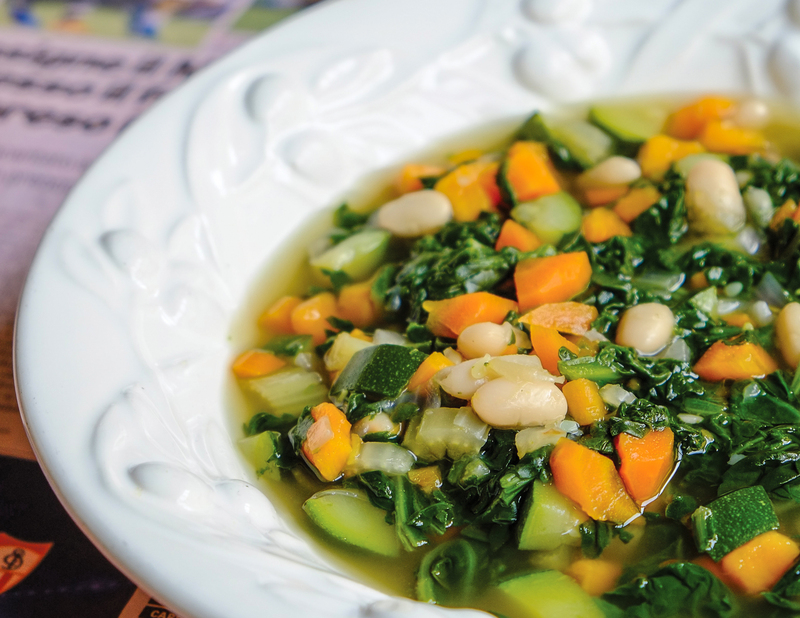 Minestrone is an iconic Italian dish, but its roots are in cucina povera. From such humble beginnings came one of the best soups in the world. Heat the olive oil in a large pot over medium-high heat. When the oil shimmers, add the carrots, celery, onion and garlic. Cook until they soften and the onion becomes translucent. Then add the zucchini and cook until the zucchini softens. Add the beans and 5 cups (1.25 L) of water and bring to a boil. 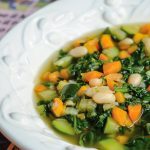 Reduce the heat to medium, add the spinach and Swiss chard and cook for about 45 minutes to an hour, depending on how you like the texture of your vegetables. Turn off the heat. Add salt and pepper to taste, cover the pot with a lid and let it rest on the stove for another hour. Just before serving, add the basil leaves and give it a good mix. Drizzle each serving with olive oil and sprinkle with some Parmigiano. I don’t call for stock. I use water because as you cook the vegetables the water becomes richly flavored. But if you have some on hand and want to use it, be my guest.